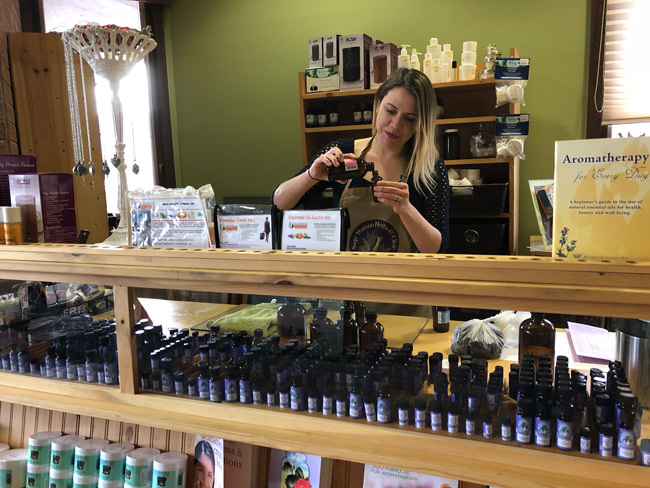 Sage Consulting and Apothecary is a full service herbal apothecary where tinctures, capsules, teas and herbal oils are formulated and prepared on the premises. 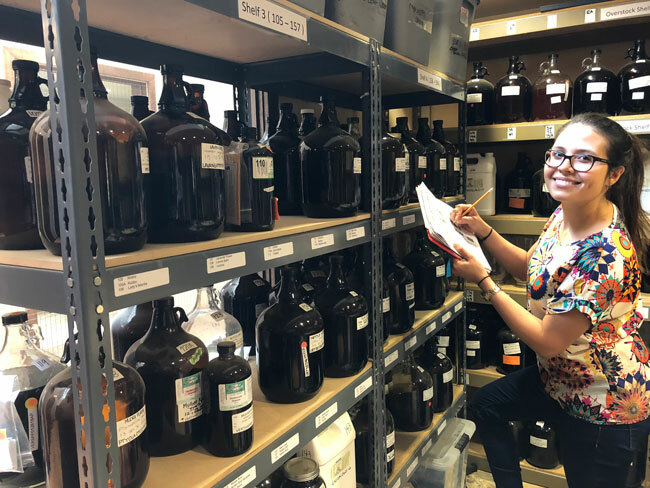 Here are some behind the scenes photos of our team, including our store manager, pharmacist and staff preparing herbal formulations before making the journey to you. Blending our formulas and stocking herb bottles is a daily task. Carmen is semi-retired, owns a local gardening business and works for us part-time. Her new found passion is herbs and she graduated with flying colors from the 2017 Sage Herbal Foundations Program! 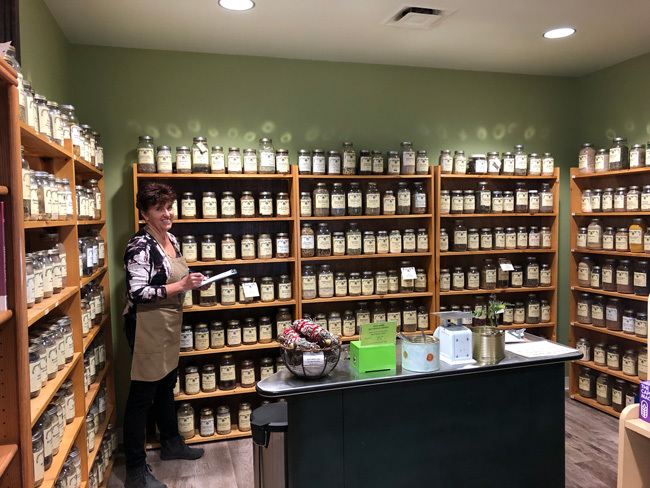 She works hard to keep the bulk teas and formulas blended and the encapsulated herbs stocked and ready to ship out to you. For dried herbs (with the exception of resins and a few others), we use the the percolation method to prepare our tinctures. We find this method yields a stronger tasting, darker tincture. Besides these organolyptic observations, we have found that the medicinal strength of the tincture is superior than the maceration method. 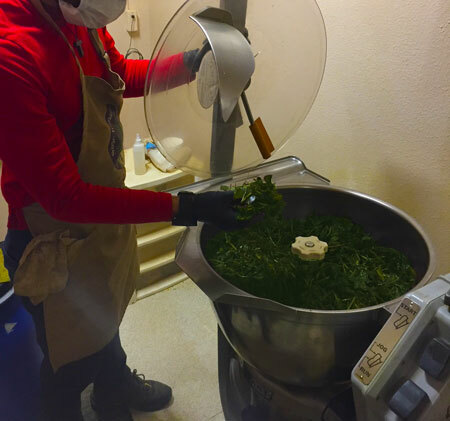 This method requires several steps, including grinding the herb to a certain consistency, moistening it using a mixture of organic cane alcohol, allowing it to sit for 24 hours until the constituents can be drawn out of the herb. Next it is packed into a hand-blown percolator cone and the menstruum is allowed to drip through at a slow, even pace. Once it has percolated all the way through, the herb "pulp" (or what herbalists call the "marc") is pressed out using our small hand-pumped herb press. while the dry plant extracts are ground minutes before extraction and are prepared through the laborious cold drip percolation method, all to exacting standards to maximize potency. Organic cane alcohol and water are used to extract the most difficult to digest biochemical compounds. Ratios of herb to menstrum are calculated by the potency of the herb. We use US pharmaceutical organic cane alcohol and filtered, ionized water. We never use industrial alcohol or hexane. 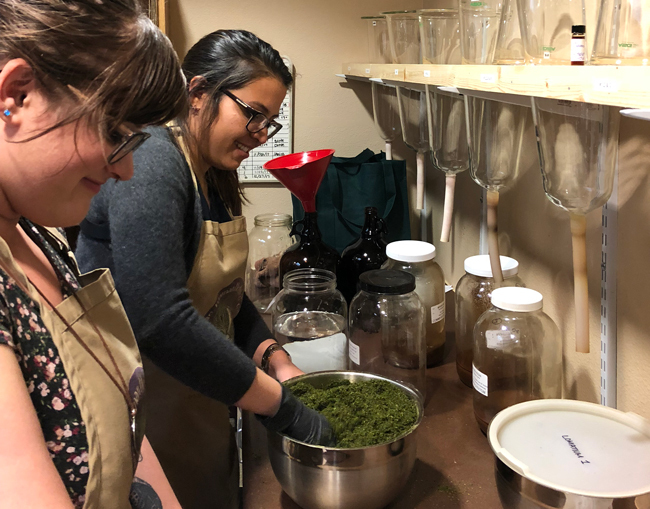 Yaremi and Anna work hard every day in the herb lab, preparing our percolations and fresh plant macerations in order to provide beautiful, potent tinctures to help in healing our clients and customers. Yare is a unique treasure, a trained pharmacist who acquired specialized training in quality control in Barcelona. Anna is her wonderful assistant who fell in love with herbal healing and was recruited to work for us because she was one of our top students in the 2017 Sage Herbal Foundations Program. Specific herbs must be prepared from freshly harvested herbs. A few examples of this are Bidens, Lobelia, Ocotillo, and St. Johnswort. These and other herbs are gathered fresh and then "macerated", or soaked immediately in an organic cane alcohol/filtered water blend for 6 - 12 weeks. 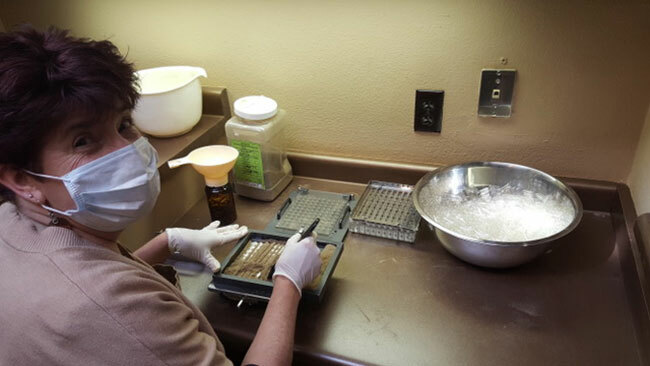 Here Yare takes inventory of our stock to ensure we keep our valuable medicines available. We are so proud of our "new" refurbished Hobart blender, which holds 10 gallons of fresh herb and menstruum - perfect for preparing top quality fresh macerations! Pictured here is Yare's talented husband Franco, who helps us prepare fresh Bidens pilosa for a 6 week maceration process. 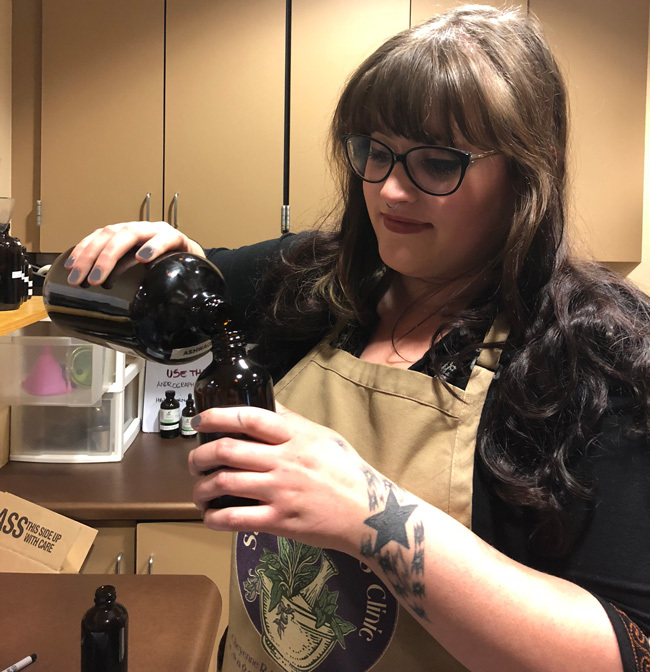 Close by the lab is our blending room where all of our formulas, including special client blends, are carefully mixed and poured up by all of our staff. Our essential oils are gas chromatography and mass spectrometer tested for purity. We do not make essential oils, but we buy them in bulk from a top quality supplier and pour them up. This saves you a lot of money for the highest quality organic, wildcrafted and carefully cultivated aromatherapy oils. None of our oils are diluted with carriers. Leigha is one of our most talented staff. She is also an herb lover, and is learning and growing on the job. Dependable and organized, Leigha keeps our many containers, tinctures and capsules fully stocked.